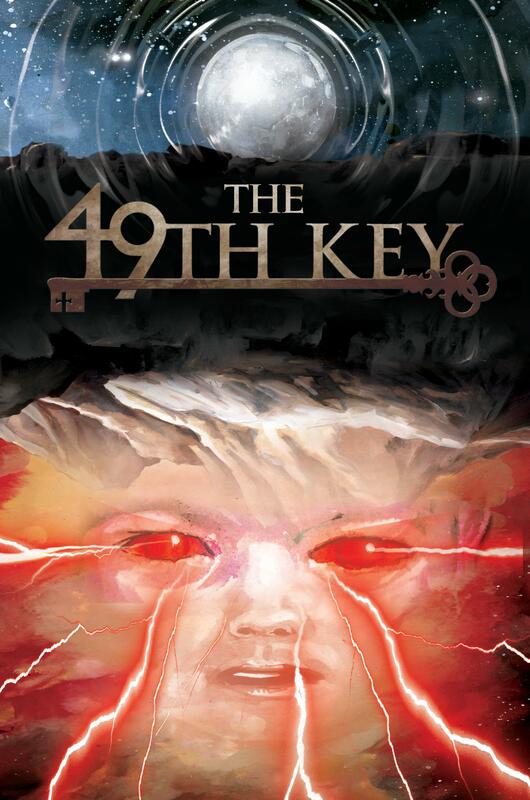 Home › comics › The 49TH Key Rushed to Second Printing!! The 49TH Key Rushed to Second Printing!! For forty years, Heavy Metal has been the leading anthology of science fiction and fantasy, breaking new talent, and providing a platform for legends in comics and genre to push the boundaries of visual storytelling. This tradition continues in The 49TH Key, an original story from Erika Lewis and artist J.K. Woodward, which premiered in the pages of the historic magazine in 2015. Now, upon today’s release of this anticipated graphic novel in comic shops, the book is sold out at Diamond Comic Distributors! 49th Key is based on the 16th century legend of Enochian magic, which tells of a secret language of angels. The first chapter in an expansive fantasy series tells of a rogue archeologist and a young mute boy on a treacherous journey through England to bring the boy home. The boy turns out to be the key to a gateway between our world and that of Enochia, a magical society that exists below the Earth’s surface, filled with fantasy creatures and highly advanced humans. “A simple visit to the British Museum sparked an idea. While living in London, the story started to come together. And with J.K. Woodward’s incredible talent, it now comes to life” says writer Erika Lewis. Erika Lewis and J.K. Woodward’s The 49TH Key is a beautifully painted 120 page original graphic novel, which was initially serialized in Heavy Metal Magazine from 2015-2016. With 12 never-before-seen pages, signed and limited first printings of this collected edition are ONLY available in your local comic shop, while supplies last. The title will release in limited quantities in finer bookstores everywhere on Decemeber 19. Details on second printing are forthcoming. J.K. Woodward started his professional comics career in 2003 and went on to work on several titles for IDW, BOOM! Studios, Dark Horse, Archaia and Marvel. He’s worked on such titles as X-Men Origins:Beast, Star Trek, Doctor Who,Peter David’s Fallen Angel, Mars Attacks and more. He currently illustrates Peter David’s Fallen Angel as a reoccurring miniseries for IDW as well as various cover and sequential work for multiple publications. His most current projects include illustration for the Star Trek/Doctor Who, 8-issue mini series, Assimilation2, Star Trek: City on the Edge of Forever, the Harlan Ellison original Teleplay and the latest Star Trek mini series, Star Trek The Next Generation: Mirror Broken, written by Scott and Dave Tipton. Heavy Metal is an American science fiction and fantasy comics magazine, known primarily for its blend of dark fantasy/science fiction and erotica. At 40 years of age, Heavy Metal is the fourth oldest American comics publisher, and some of the greatest European and American comic book writers and artists in history have appeared in the pages of legendary publication. Since the magazine’s inception in 1977, the Heavy Metal banner has been seen in video games, television, and a 1981 animated feature film. In 2015, the brand announced famed comic book writer Grant Morrison as it’s Editor-in-Chief, and established it’s first-ever line of traditional monthly American comics. The brand is overseen by Publisher Kevin Eastman, and CEO Jeff Krelitz.